When January rolls around, talks about resolutions, goals, and a fresh start are so very common. And the idea of a “word for the year” is nothing new. The idea of setting a theme for the year with one word has been floating around for awhile. I will be honest, right along with resolutions, I always thought the one word intention was hokey and kitchey. I mean how could you base your entire year’s worth of goals around one word? It just seems so lofty, and how do I mark a check next to a word theme? I will tell you with January almost over, I am already behind on more than half of my goals that I set forth. So when I listened to my friend’s podcast about intentions (which I highly recommend anyone to find Friends in Pursuit), I was intrigued to sit on this idea of “one word” a little more. I started thinking about the past year. While it brought me some great things, it did come without some incredible challenges. My anxiety has reared it’s ugly head more than I am comfortable with, and dealing with a four year old is quite possibly going to give me a full head of gray hair. In their podcast and workbook on intentions, Kari and Andrea asked a question that kind of threw me for a loop. What word describes a mindset that would have helped face the lessons learned? Breathe is the word that came to my mind like a smack in the face. My anxiety comes in the physical form of nausea and shortness of breath. It makes me flush, and I have a hard time calming my heart rate down. It can be a struggle to focus on breathing because it feels like I am stuck in an elevator that is about to plummet 100 floors. So breathing focus is something I know from counseling that I need to do a better job of doing. I thought of a lot of words for my year: grace, humility, drive, comfort to just name a few. But I kept coming back to breathe and how so much of my challenges are brought on by my own anxiety and the inability to sometimes control my body. I need to breathe in the moments with my children instead of hoping for the next stage to come. Wishing this time away does no good for anyone. I need to pause more instead of rushing through it. I need to breathe before I respond to George’s tantrums instead of snapping back to gain control. Breathing will keep me humble and remind me that I am his role model and how I respond means more than just that one moment. I need to breathe when I feel my heart start to race. Mindfulness is something that has never come easy to me, and I know breathing is so much of that exercise. I need to use the focused breathing exercise on my Fitbit to start training my mind and body to self-regulate. I need to take a breath to instill patience over things and actions I cannot control. I need to take a breath to sometimes watch my mouth and be more careful with the words that I say. I need to sometimes just take a breath and give myself a break instead of jumping to worst case scenario and stop the planning machine that occurs in my head. I need to breathe in the opportunities of new friendships and new initiatives instead of worrying about being out of my comfort zone. I literally need to breathe fresh air more. One of my goals is to get outside a ton, so it is only natural to think about breathing in the outdoors. I need to count my breaths as opportunities to be me and not someone else. For me, breath encompassed all the other words that I was thinking of initially. Breathing is an action. Breath is a moment in time that will help me focus. There is so much work that can be done in a breath. And sometimes I need to sit in that breath. In these breaths, I can trust that whatever this is will pass. In between breaths, I can let go and let God. 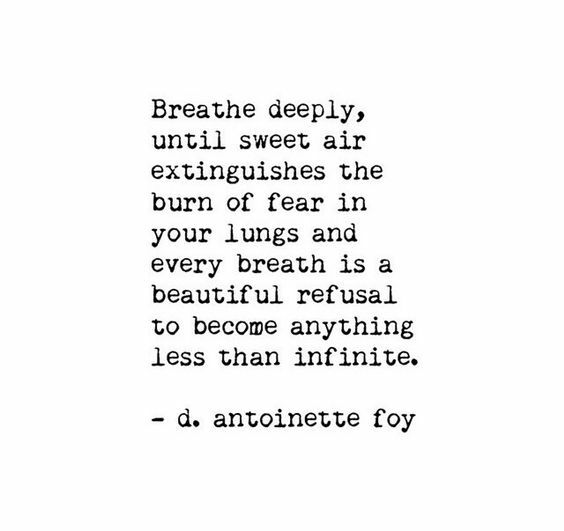 I often try to rush through this lesson, so focusing on something so small like a breath will remind me that none of this is permanent. A breath can help me connect: with myself, others, and God. 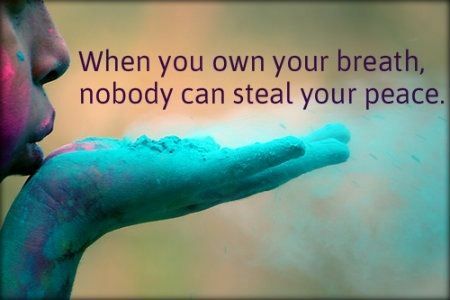 A breath can give me power. A breath can give me calm. A breath can give me grace. 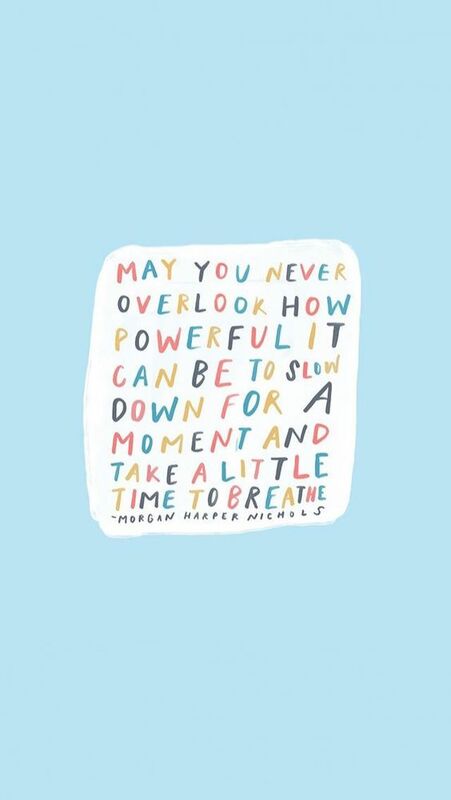 A breath can give me “me” back in those moments of stress. Just one simple word that holds so much meaning. And seriously, if you like podcasts, I highly recommend listening to Andrea and Kari! This entry was posted in It is what it is and tagged breath, breathe, breathing, intentions, new year. Bookmark the permalink. My intention is to accomplish the goals I’ve been writing each month. I’ve realized that monthly goals are much easier for me to stick with than general New Years’ resolutions or a word of the year.